I hope this is in the right place I really love Bloom's alpha dresses and my teen D girls needed some outerwear. I hate it when they go out the door and change into something completely different. I just throw on a jacket when I go out and always thought it was sort of silly for them to change completely. So I fixed it, at least for my teen D girls. This is a new mesh based on Bloom's fabulous and versatile alpha dress, all credit for the mesh and these textures (except the jacket) goes to Bloom. I just took the big fluffy coat from the base game and slapped it on there, it's alpha editable so you can keep it long or make it short. Credit for the teen D body goes to Warlokk of course. Vanity, these are excellent! I can't wait to use them in my game. Bloom, are there any plans for an A cup small hips and a C cup large hips alpha dress? The reason i never released one. 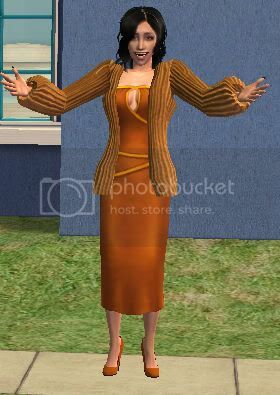 I just got my site up and from now on ill be only creating sims 3 stuff. I don't have Sims 3 yet and had no plans to, but if you are going to make meshes for it I may change my mind Congrats on the new site!